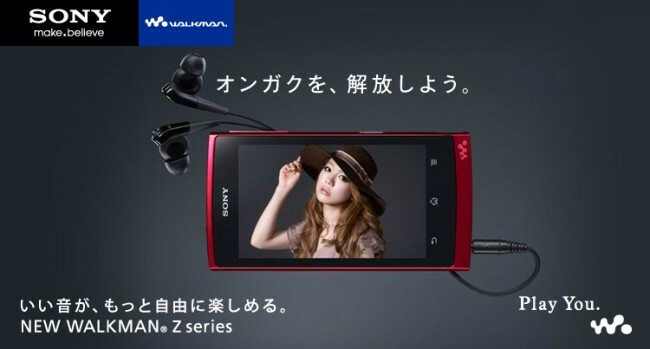 Sony Japan has unveiled the new Android Walkman dubbed the Z-Series. Slated for a December 10th debut, the new Z-Series comes in 3 different capacities (16, 32 and 64GB) and 2 different colours, red and black. The screen is a 4.3in LCD with a resolution of 480x800. Like the X-Series, the new Z-Series will ship with the S-Master MX Amp. Digital Noise Cancellation is also supplied to cut out 98% of outside noise. Other features like DSEE, clear bass and clear stereo also come standard. The new W button will allow the user to operate the player and bring up controls even when the player is locked. I would think this is for playback control since there are no physical play/stop buttons. When playing back music, the user has a choice of 3 different visualizations which they can choose to display while playing back music. The new Z-Series ships with Android Market which will allow for installation of hundreds of different applications and games. Connectivity is also very rich with bluetooth, hdmi out and DLNA support. Sadly codec support is not the greatest but hopefully this can be fixed with other applications from the market place which can play more codecs. Specifications and link to photo gallery after the break. Yeah!..But if you already own Xperia Arc????? ?